The ability to make inferences is a crucial aspect for the comprehension of texts, through which the reader anticipates details not explicitly expressed and builds a mental representation of the content. This volume stems from the need for an instrument to strengthen inferential processes through targeted training, to ensure that children who experience difficulties in understanding become more and more skilled in the correct interpretation of a story. cognitive flexibility (the possible resolution of inconsistency as an alternative to that adopted previously). 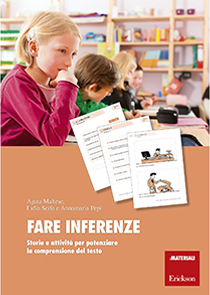 Making inferences was designed to help children in the second cycle of primary school who have difficulty understanding the text, or who have a specific learning disability.